It’s that time of year again. The air is getting cooler and the days are getting shorter. One thing that always creeps up on us is fall foliage – so pretty to look at when it’s on the trees, yet so painful to clean up once it has nestled itself all over your property. In order to be better prepared this season, find out when your region expects peak leaffall, as different areas will vary across the months of September, October, and even into November. The Weather Channel provides a tool that can tell you when foliage is at its peak in your area. From there, you can plan that 1-2 weeks later, all those beautiful leaves will be dead brown ones on your lawn. Another resource to use is the Storm Fax Foliage Map, an aggregator of state web-site leaf content. With this type of projection, you will know when to expect the majority of leaves to fall onto your property, and can plan accordingly for removal. The benefit of planning out a good weekend or chunk of time is that you don’t over-commit or underestimate and then come to regret it later in the season. For example, if you set aside the first weekend of October for yard work and leaf-removal, you’d be regretting it if you spent that time and effort then, only to have “peak” time occur two weeks later and be faced with the decision of cleaning up the yard again or leaving it un-touched. 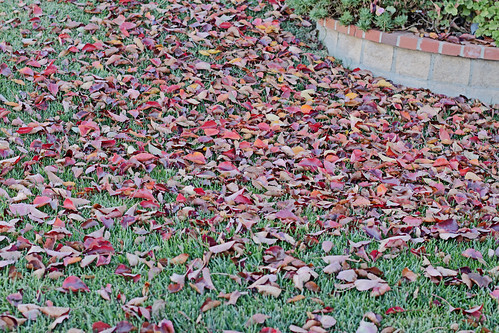 By utilizing a chart that estimates when peak leaffall is, you can set aside one day – and only one day – for yard work and leaf removal, and feel like you’ve gotten most of what will come down this fall. Hopefully, whenever you plan your yard clean up, it doesn’t also involve un-clogging leaves from gutters. If it does, then it’s time to seriously consider installing a new gutter system that won’t clog. The dangers of clogged gutters are numerous. Stagnant water and damage to the foundation and trim are just a few of the issues you could face if you ignore clogged gutters for long enough. Remember – plan ahead and only spend one day on yard work and leaf removal. Good luck and be careful.